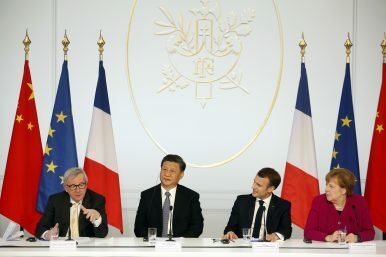 French President Emmanuel Macron, 2nd right, his Chinese counterpart Xi Jinping (2nd left), German Chancellor Angela Merkel (right) and European Commission President Jean-Claude Juncker hold a press at the Elysee presidential palace in Paris, March 26, 2019. Explain the impact of Italy’s decision to endorse China’s Belt and Road Initiative (BRI) on EU political fractures. Italy endorsed a Memorandum of Understanding on the Belt and Road initiative during Xi Jinping’s visit in late March. Timing-wise, this coincided with the EU institutions coming out with a set of recommendations on how to toughen EU’s China policy. As a conceptual novelty, China was also a labelled a “systemic rival.” Crafting such a stronger negotiation position for the EU necessitates that member states back that up. Internal division and pre-emptive obedience to China has often hindered that. Italy became a poster boy for that approach, as it was rolling out the red carpet for President Xi with the aim to attract further trade and investments with China. This has been a constant tension: that member states cozy up to China on bilateral visits and then expect the EU to take care of the tougher parts of policy, including human rights issues and trade concerns. In that sense, the visit in Italy is merely a continuation of that approach. On BRI in general, the EU is less dismissive than the U.S. but tries to make sure the initiative becomes a two-way street and not a one-way to Beijing, as French President Emmanuel Macron said. The EU has launched its own connectivity strategy, which aims to secure open tenders and international standards in infrastructure cooperation. For policymakers in the United States (and in Japan, for that matter) the EU strategy is an opportunity to engage European allies on these issues. The ambition should be to connect the EU’s strategy with the free and open Indo-Pacific approach espoused by the United States, Japan, and India. In contrast to the Italy visit, Xi Jinping met a united European front in Paris. President Macron had, partly based on the lack of unity around the Italy visit, invited [German] Chancellor Merkel and [European] Commission President Juncker to join his meeting with Xi. That was a novelty and might spell more European unity on dealing with China. Analyze how the Huawei case is exacerbating fault lines in EU intelligence-sharing and transition to 5G technology. The EU and its member states must decide whether they find Huawei’s public assurances that the company’s networks do not pose a security risk satisfactory. The EU Commission recently came out with recommendations for 5G, which will be the building block for having the EU’s cyber authority, ENISA [European Union Agency for Network and Information Security], have a greater say on compliance. This can gradually give the EU a say in this matter. So far, in member states the most common response has been stalling, as Germany, which will be pivotal for European decision-making, is doing. The United Kingdom, despite being part of the Five Eyes, is also buying time with a review of its policy, which so far has been welcoming of Huawei. Others have already thrown in their lot with the company, like Portugal with a Huawei-run 5G network and the small princedom of Monaco where Xi Jinping sandwiched in a meeting between Italy and France on his recent Europe tour. At the other end of the spectrum, in Poland the authorities have arrested a Huawei employee on espionage charges and called for a broader debate in NATO or EU on cybersecurity and China. In Denmark, the national tele-provider TDC recently deselected Huawei and opted for Ericsson for rolling out 5G. In my view, there is legitimate reason for concern about Huawei or other Chinese companies like ZTE moving into critical infrastructure in European democracies. Legislation in China has been tightened and Chinese companies are obliged to cooperate with the intelligence services. The country remains an authoritarian, one-party state with little transparency into its inner workings. That means the suspicion will linger about any Chinese company that is involved in European critical infrastructure. During the last decade, European countries learned the hard way that Russian gas was more than just Russian gas. The EU should not repeat the same strategic mistake with China and telecommunication, which in the next generation will be the building block for the “internet of things,” powering everything from personal pacemakers to public infrastructure. The question of Huawei will continue to be a thorny issue in Europe. In contrast to the U.S., Huawei is already quite integrated into many national systems on 4G, so merely removing Huawei from 5G auctions will not eradicate some European dependency on Huawei. Explain the strategic implications of China as a “systemic rival in promoting alternative models of governance” on the EU’s China policy. For somebody like me, who has tracked the EU’s China policy for many years, this is a radical change – in rhetoric at least. The litmus test is if the EU manages to translate this into a more hard-nosed policy based on reciprocity and clear demands. Equally important, member states need to be behind this to have any effect. Still, among the EU’s 10 action points, there are none that address the governance challenge, which is where China is increasingly opposing the EU’s system of freedom and openness. This should be next on the list of issues to be tackled. China has also shown increasingly the capability and willingness to interfere in democracies abroad. For example, Australia and New Zealand have seen increased interference through the operations of the Communist Party’s United Front with elite capture of business executives and politicians through political party financing and the takeover of Chinese diaspora news channels. For the EU and Western democracies, it is no longer only a question of trying to promote human rights in China, but of defending their values at home. In the last decade, the EU and its member states have failed in this regard. First, when China succeeded in dictating to European leaders that they could not meet the Dalai Lama, a Nobel Peace Prize recipient, on home ground. And second, when Norway was subjected to a “deep freeze” by China for years after the dissident Liu Xiaobo was also awarded the Nobel Peace Prize. The EU and its members, and other democracies worldwide did not speak up for Norway, which in the end issued a semi-apology to mend relations with China. The current test is China’s broad-based hostage diplomacy with Canadian citizens detained in the country, apparently in retaliation for the arrest of Huawei’s chief financial officer in Canada. A united EU should take a more forceful stance on this. Such cases are the new arena of value challenges for democratic countries when it comes to China. Assess how China’s long-term strategic calculus in formulating the “16+1” framework with Central Eastern European countries. China has used the 16+1 format to carve out a friendly Eastern European grouping inside the EU including with surrounding states from Southeast Europe. For European countries, a large backdrop for the 16+1 cooperation was attracting Chinese investments. On April 10, Chinese leader Li Keqianq will participate in a 16+1 summit following the EU-China summit on April 9. Whether the EU members of the 16+1 format will carry forward the same EU messages remains to be seen. Still, for many of the smaller EU states, the 16+1 has also been a way to get – even if short – bilateral facetime with China’s leadership. The fact that the U.S. is pushing EU countries harder on China policy might compel some Eastern Europeans to reassess their closeness with China. For example, the combination of an actual espionage case and the United States’ priority on the Huawei issue might compel Poland to reassess the value of Chinese investments as well as of the 16+1 format. What are the geopolitical implications of China’s expanding influence in Europe on transatlantic relations, and why should Washington be concerned? Washington should be concerned but not alarmed. The U.S. government’s public threats on Huawei and the Belt and Road Initiative to European allies might not have had the desired effect. Some Europeans instead add it to the growing list of disagreements with the Trump-administration, such as exiting the Iran deal and re-imposing sanctions, recognizing the Golan Heights and Jerusalem, etc. Rather, the U.S. administration should welcome the new tougher turn in EU policy on China and seek to strengthen cooperation on the free and open Indo-Pacific concept and associate with Europeans, through NATO and the EU, more on defense planning in Asia. France has been a European leader including on the South China Sea and upholding freedom of navigation.